You’ve likely heard the numerous recommendations for using Bt pest control, or Bacillus thuringiensis, in the home garden. But what exactly is this and how does using Bt in the garden work? Keep reading to learn more about this organic form of pest control. Bacillus thuringiensis (Bt) is actually a naturally occurring bacterium, common in some soils, that causes disease in certain insects, most notably leaf and needle feeding caterpillars. It was first discovered in the early 1900s. The French were the first to advocate using Bt in the garden and by the 1960s, Bacillus thuringiensis products were available on the open market and were readily embraced by the organic gardening community. Controlling pests with Bacillus thuringiensis is dependent on its active ingredient, a crystal protein, which paralyzes the digestive system of the insect. The infected insect stops feeding and starves to death. 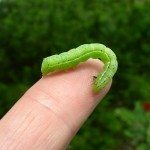 While the original strains of Bt pest control were directed at caterpillars such as tomato hornworms, corn borers or earworms, cabbage loopers and leaf rollers, new strains have been developed to attack certain flies and mosquitoes. Bacillus thuringiensis products have become an essential weapon in the battle against West Nile Virus. Some field crops, such as corn and cotton, have been genetically altered to contain the gene for the crystal protein in their plant structure. All in all, controlling pests with Bacillus thuringiensis has become a marvelous tool for eliminating certain insect species from both the commercial and home garden. Its use helps reduce the amount of chemical insecticides in our environment and is harmless when eaten by beneficial insects and animals. Study after study has shown that using Bt in the garden is perfectly safe in its application and ingestion by humans. Now that you have the answer to what is Bacillus thuringiensis, it probably sounds like Bt pest control is the only way to go, but there are a few things you should know about Bacillus thuringiensis products before you begin. First and foremost, read the label. You don’t need to use Bt in the garden if you don’t have the pests it eliminates. Bacillus thuringiensis products are very specific in the insects they will or won’t kill. As with any pesticide – manmade or natural – there is always the danger of insects becoming immune and you don’t want to add to that problem with overuse. Secondly, Bt will only affect those insects that actually eat it, so spraying your corn crop after the larvae have made their way inside the ear will be of little use. Timing is crucial, so the observant gardener won’t try to spray the moths or eggs, only the leaves the larvae will eat. For those specified insects that do ingest the Bt product, be aware that starvation can take days. Many gardeners who have previously applied only chemical pesticides are used to the immediate effects on insect’s nervous systems and, therefore, think Bt pest control doesn’t work when they see the insects still moving. Bacillus thuringiensis products are highly susceptible to degradation by sunlight, so the best time to spray your garden is early morning or evening. Most of these products adhere to the foliage for less than a week following application and the period shortens with rain or overhead watering. Bt pest control products have a shorter shelf life than most chemical insecticides and should be stored in a cool, dark place. It’s best to buy no more than can be used in a single season, although manufacturers generally claim a reduction in effectiveness after two to three years. The timeline for liquid applications is even shorter. If your garden is bothered by any of the susceptible insects, Bt pest control might be something to consider. Controlling pests with Bacillus thuringiensis can be an effective and environmentally friendly way to treat your garden. Knowing about what Bacillus thuringiensis is and how and when it should be used is the key to its success.